The first night of the 3-night Fashion X Houston started out with a view of beautiful Cadillac cars, then led into a room filled with fashions everywhere! 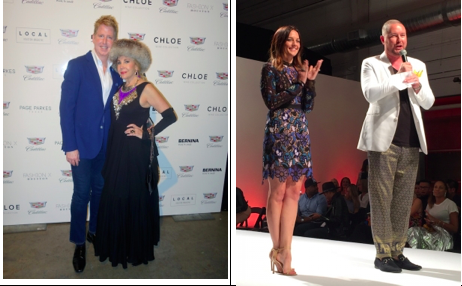 Hundreds of Houstonians came to the first ever Fashion X Houston and we were not disappointed. The evening started out with galleries from stores and designers where you could shop on the spot. There were several photo-backdrop opportunities and lots of food and drink. This all led up to the huge runway event that included Miles David, Jimmy Burner, Sixchel, This is Sloane, Rask and capsule collections by Carlos Castillo, Shehla Rana, Daniel Esquivel and Sean Kelly. Popular lifestyle blogger Caroline Harper Knapp, of House of Harper, was the “Style Setter” of the evening. We even got to see some excerpts from her closet, which were adorable! The show closed with a jaw-dropping runway presentation by young designer Nicholas Ngyugen of Mysterious by NPN, who exquisitely reflected his Vietnamese heritage in his designs. The energy of this entire runway show was intoxicating because each designer presented completely unique collections and all-over-the-map different from one another. David Peck’s collection was extremely elegant and timeless. Jimmy Burner’s collection was street-wearable and urban. Sloane’s pieces were colorful and way-out funky (which I loved), and Shehla Rana’s collection was exquisite with Indian influences. Nicholas Phat Nguyen, who received an award from Bernina for up-and-coming designer, received a standing ovation after closing the show. Austinite Matt Swinney, who founded Fashion X Dallas and Fashion X Austin, has finally brought it to Houston. Yay!! The opening evening consisted of nine full runway shows which included All-Stars from Project Runway, shows from local Houston designers, shows from emerging designers outside of Houston and mini-capsule collections from rising Texas talents. In addition to all that, there were plenty of super-stylish Houstonians in attendance. I don’t even know where to begin talking about everything!